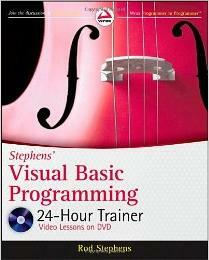 Start from scratch, and even if you don't know a thing about Visual Basic, you soon will with this thorough introduction to Visual Basic programming. Using easy-to-follow lessons and step-by-step instruction, this practical book teaches you concepts and hands-on techniques, then reinforces your learning with video screencasts and supplemental materials. Follow the exercises, then access the Try It section on the DVD, and watch as well-known VB authority and author Rod Stephens works through programming problems. The lessons within the book are each accompanied by an instructional demonstration on the DVD--over 4 hours of video tutorials! This book does not assume you have previous programming experience. Here are some excerpts from comments about the C# version of this book, Stephens' C# Programming with Visual Studio 2010 24-Hour Trainer. See the full comments on Amazon's web site. The fastest way to learn C#! ... After a few days with Rod's book and DVD combo, I'm more convinced than ever it's "that good" if you are just getting started with Visual C#. And don't let the title fool you--there is a lot of breadth in the book and sufficient depth to keep you occupied, even while Stephens makes the learning enjoyable. ... It contains many essential language features, clear and concise explanations, useful screen shots, and detailed exercises you can follow and practice. ... The CD gives step by step instructions for the lessons in the book and Rod will help if you get stuck, he help me when I was stuck and he solved my problem very quickly so that I could move on with the books lessons. I can't verbalize how happy I am that I purchased his book.